Alabama Home Mortgage Loans (AHML) was crowned Top Broker in Alabama for the year 2018! United Wholesale Mortgage, better known as UWM, presents this award each year to its highest producing broker account in each state. We are proud to be recognized as Alabama’s Top Mortgage Broker by UWM, the largest wholesale lender in the country. In 2018, UWM finished with $41.5 billion in total loan volume, comprising nearly one quarter of the wholesale industry’s market share. UWM is also the #1 non-bank purchase lender in the country. Top honors were also earned by a member of our staff at AHML. We are honored for this recognition and continue to be an independent source for Alabama consumers and Veterans! Why Use A Broker Network? At AHML, our goal is to offer each of our customers with the best mortgage loan experience possible. To make this happen, we need access to the best products, tools, and technology in the mortgage industry. Our partnership with UWM makes this possible, enabling us to fulfill our commitments to our clients and exceed their expectations. As we kick off a new year, AHML looks forward to continuing our mutually beneficial relationship with the professionals at UWM. We appreciate organizations that “lead from behind” but still give credit where credit is due. 1. ^ Source: Smith, Ryan, and Shant Banosian. “United Wholesale Mortgage Announces Significant Changes to Rates and Pricing.” MPA, Mortgage Professional America, 8 Jan. 2019, Website➚. 2. 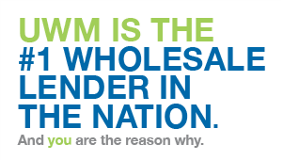 ^ Image Credit: “UWM Is the #1 Wholesale Lender in the Nation.” UWM, UNITED WHOLESALE MORTGAGE, 1 Mar. 2016, Link to website article➚. Link to graphic➚. Graphic found in Google image search linked to this article.